Abstract : The ILO project entitled “Eliminating Child Labour in El Salvador through Economic Empowerment and Social Inclusion” was aimed at helping to eradicate child labour in El Salvador. The project supported a large range of interventions at three levels: macro (national policies and institutional framework), meso (target municipalities and schools) and micro (child labourers’ households). One set of household-level interventions, implemented in five municipalities in El Salvador, is the object of the impact evaluation discussed here. The impact evaluation is one of the first to identify the causal effect of an IPEC project using a quasi-experimental approach with a valid counterfactual. The targeted set of interventions consisted of support to mothers of child labourers to start a small enterprise as well as of so-called “flexible education interventions” to help their children return to school at the appropriate level in case they have dropped out. In April 2012, UCW (in collaboration with the ILO El Salvador) drafted an impact evaluation design. As part of this design, UCW proposed to allocate the set of interventions to eligible households on the basis of a wealth index. This procedure ensures a fair distribution of the interventions to those households who are most in need. At the same time, as explained in UCW (2012), this allocation procedure can be exploited in a regression discontinuity framework to identify the causal effect of the set of interventions on outcomes of interest, such as education, child labour, participation in work of adult household members, and multiple other wellbeing indicators. The ILO conducted a baseline survey in the five municipalities in April and May of 2012. Subsequently, UCW (again in collaboration with the ILO in El Salvador) used these data to generate the wealth index utilized to assign the intervention. 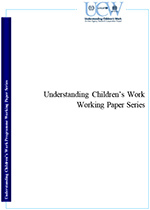 This process is described in more detail in the baseline survey report released in 2013 (UCW 2013). The follow-up survey was undertaken in July and August of 2015. The current Report discusses the results of the follow-up survey and of the impact evaluation more broadly.